Woodcut, 10 ½”h x 14 ¾”w plus margins, uncolored. This remarkable map was compiled by Giacomo Gastaldi for Giovanni Ramusio’s Navigationi et Viaggi, the third volume of which focused on American explorations. It reflects Gastaldi’s attempt to synthesize information from two epochal voyages, both conducted on behalf of King Francis I of France. 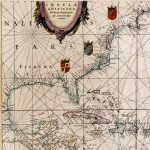 The first of these had occurred in 1524, when Giovanni Verrazzano became the first European to sail the coast between Florida and Nova Scotia. The second was Jacques Cartier’s 1534 exploration of Newfoundland and the Gulf of St. Lawrence, which provided the basis for French claims to New France. La Nuova Francia depicts the coast between New York Harbor (“Angoulesme”) at lower left and “Terra de Laborador.” Emptying into New York Harbor is a large river that curves to the North and East before emptying into the Gulf of St. Lawrence (Verrazzano had in fact sighted the mouth of the Hudson, but the rest of this river is probably conjectural or an awkward attempt to synthesize Native American reports.) The map then follows the Long Island coast (“Flora”) and that of Rhode Island (where “Port du Refuge” identifies Narragansett Bay and “Brisa” probably represents Block Island). It then jumps to “C. de Breton” with no sign of the intervening coastlines of Massachusetts, New Hampshire and Maine. This omission may have been due to the hazardous navigation off the coast of Cape Cod, Martha’s Vineyard and Nantucket, which could have forced Verrazzano to swing far to the east and thereby fail to sight much of the New England coast. Newfoundland (“Terra Nova”) is shown as a jumble of islands reaching south to the latitude of New York harbor. 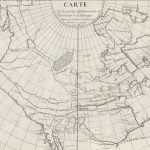 Oddly, though Ramusio’s text describes Cartier’s 1535 second voyage, during which he navigated the St. Lawrence as far as Montreal, these findings are not shown on the map. The map’s coastal geography closely resembles the northeastern section of the Tierra Nueva, a map of the American East Coast published by Gastaldi in 1548. 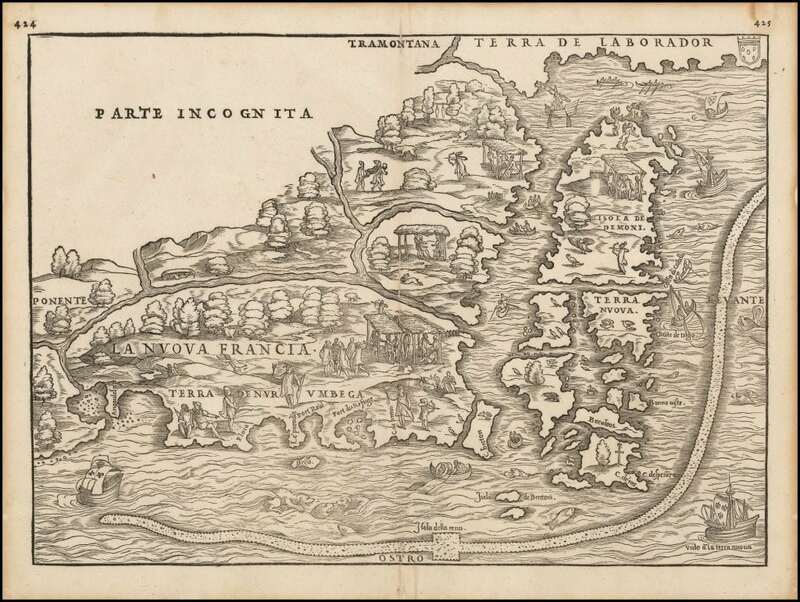 That earlier map was far smaller, however, and lacks the multitude of details that make the “Nuova Francia” a vastly more engaging and interesting piece of work. The most eye-catching feature introduced on this map is a long, stippled line—resembling a caterpillar!—running parallel to the coast. This probably represents the Grand Bank, though it has been suggested that it depicts the Gulf Stream. The land masses are crowded with ethnographic imagery, showing the native American inhabitants hunting, cooking, dancing and socializing, with one dozing under a canoe at upper left. Also of interest are the numerous images of the hard, dangerous work of the cod fishery off Newfoundland. From the early 1500s on, and possibly earlier, hundreds of fishing vessels plied these to serve the dietary needs of Europe’s many Catholics. This was the first economic benefit derived by Europeans from North America. This map is also significant for its use of the term Nuova Francia to designate French claims in northern North America. These claims are bolstered on the map by the small cross, surmounted by a fleur de lis, planted in the vicinity of “C. de’ ras” (Cape Race)… though in reality Cartier planted the cross at a site on the Gaspe Peninsula. The map also makes early use of the designation “Terra de Nurumbega,” from an Abenaki word meaning “quiet place where two rapids meet.” Originally assigned by Verrazzano to a location in the vicinity of the Penobscot River, the name soon came to denote either a mythical kingdom located up the Penobscot River or, as here, the region now known as New England. Offered here is an impression of the first edition of La Nuova Francia, the woodblock for which was destroyed in a fire soon after publication. 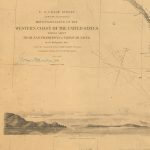 This first edition of the map is consequently scarce on the market; I have only handled it once before, and the most recent example listed by Antique Map Price Record was offered by Martayan Lan in 2006. A new block was engraved for use in the 1565 and 1606 editions of Navigationi et Viaggi, but maps printed from it are readily identifiable by the addition of what appear to be weeping willow trees. Burden, Mapping of North America, #35 (block 2); McCorkle, New England in Early Printed Maps #556.1. Verner & Stubbs, North Part of America, pp. 12-14 (illus. p. 13). Separation and tear along upper centerfold extending ca 1" into image. Slight toning along edges and in upper margin where mounting tabs were previously placed on verso.